I was lucky enough to attend the PCANZ's (Print Council Aotearoa New Zealand) Dianne Fogwell Summer School in Auckland this month. 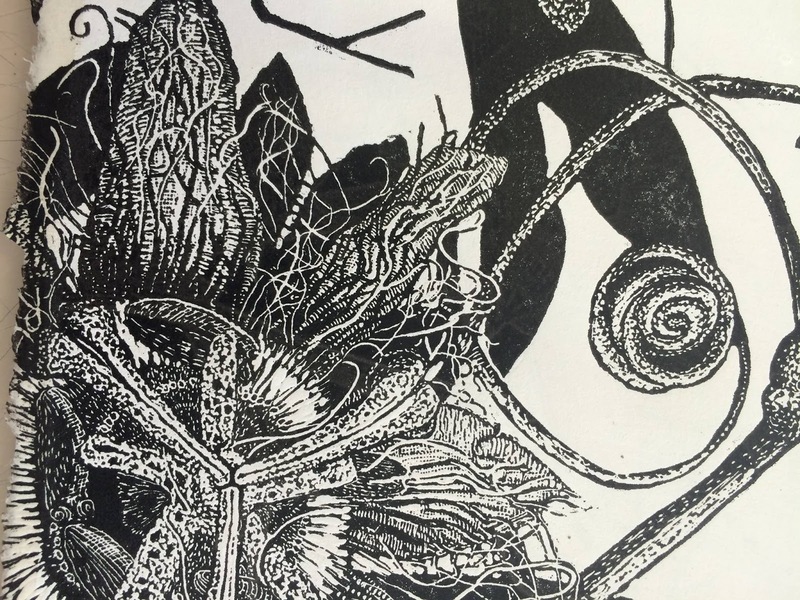 Dianne is a master printmaker from Australia and she is known for her incredibly fine and detailed lino cuts of flora and fauna, and her work as an artists's book practitioner, among many other talents. Visit her website here. The Summer School was held over 3 full days at St Cuthberts School. We were introduced more closely to her work, and we marveled at the intricate detail and the use of multiple layers and perforations. I particularly enjoy hearing about an artist's inspirations and motivations in the creation of their work and Dianne is very generous in sharing her experiences and knowledge. Over the three days we looked at Structure: of creating books and works in various formats; at creating the lino block, including cutting techniques and etching with caustic; and Printing, including hand printing and how to set up the press. and responsive to being held and manipulated. No. 1 lesson: you don't need to cut deeply at all! How freeing is that! and having the chance to play with Dianne's Micro Machine to cut the lino meant I was pretty happy with my little lino block. I never thought I would be able to cut something so finely. A whole new world of possibility! Then there was the caustic etching - somewhat scary but again new possibilities. This can be used to create freer, more painterly effects which I look forward to experimenting with further. A group of us are planning on having a "Caustic Party" so we can supervise each other's safety, feel the fear, and do it anyway. Dianne Fogwell demonstrates inking up my caustic-etched plate. The afternoons were spent working on our own ideas. It was great spending time with other printmakers, many of whom are so highly talented and skilled in their own right. 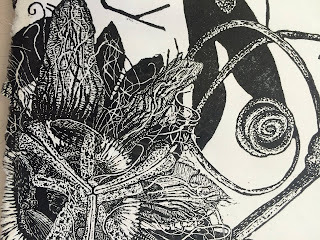 Following the workshop I have been following through with just some of many ideas generated on the course, mainly printing my caustic-etched lino block to create wee artist's books inspired by diatoms, a type of phytoplankton. and how you live in the world." members of PCANZ responsible for making this summer school happen. in sharing her limitless knowledge. Hello there Toni - that sounds like a great workshop you attended......i have to say though that i am intrigued by Dianne's "Micro Machine" Is that something you could explain ?